Readings: Joel 2: 1-2, 12-17; Psalm 51: 1-18; II Corinthians 5: 20b - 6: 10; Matthew 6: 1-6, 16-21. But for many in this culture, this is a day associated with long faces, the joyless giving up of some questionable pleasures – such as smoking – and of doing so in a way that sometimes amounts to self-indulgent penitence. But, instead, this should really be the start of a time of preparation, a time to look forward to our real hope and joy. For the countdown has just begun – we are only 40 days from Easter. I suppose Easter is in danger of losing all meaning in society today. Just like people readily sing Christmas carols even before Advent begins, I notice how people are now eating Cadbury’s crème eggs long before Lent begins – without ever thinking of the symbolism the egg once carried of the gravestone being rolled back on Easter morn and new life rising in joy. But just as the whole point of Advent is looking forward with joyful anticipation to Christmas, so too should Lent be a time of looking forward with joyful anticipation to Easter. This poem has been described as Eliot’s conversion poem. It was written to mark his conversion to Anglicanism 90 years ago, on 29 June 1927, although it was not published until 1930. In this poem, he answers the despair found in The Waste Land, and this is a poem that is less about penitence and more about repentance. In ‘Ash Wednesday,’ Eliot deals with the struggles that arise when one who once lacked faith turns and strives to move towards God. In this poem, he writes about his hopes to move from spiritual barrenness to hope for human salvation. And that is what Lent and the spiritual disciplines we associate with it are all about. At this service, some are coming forward for ashes. Others are more reserved, bearing in mind, I imagine, those words of Christ in our Gospel reading this afternoon: ‘And whenever you fast, do not look dismal like the hypocrites, for they disfigure their faces so as to show others that they are fasting … But when you fast, put oil on your face and wash your face …’ (Matthew 6: 16-17). And those words are not merely wise, but words that reprove those who would misrepresent the meaning of the Lenten fast. For I sometimes think that the misrepresentation and misinterpretation of Lent has, in turn, deprived many of its true meaning and significance. 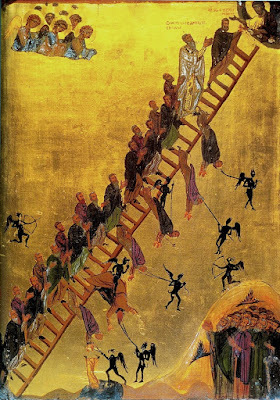 At Lent, we should remind ourselves that we have all fallen short, so that we are not the people we should be. We all too easily focus on ourselves. But true Lenten fasting allows us to experience a sense of freedom as we relinquish our self-centredness and can produce joy in our hearts – just what TS Eliot experienced, just what we pray for in the Collect of Ash Wednesday. This sermon was shared during the Eucharist on Ash Wednesday, 1 March 2017, in Saint Mary’s Church, Askeaton, Co Limerick. The Season of Lent begins today, Ash Wednesday [1 March 2017]. For my prayers and reflections each morning in Lent, I am using the Lent prayer diary produced by the Anglican mission agency USPG (United Society Partners in the Gospel), and on Monday evenings I am inviting parishioners to the Rectory in Askeaton, Co Limerick, for a series of Bible studies based on Bishop Kenneth Kearon’s Lenten Bible Challenge to the Diocese of Limerick and Killaloe. To mark Ash Wednesday, we are having a celebration of the Eucharist, with a traditional Ash Wednesday observance, in in Saint Mary’s Church, Askeaton, at 8 p.m. this evening. I have been preparing and praying about that service today, and spending time this afternoon preparing ashes, using Palm Crosses from previous Palm Sunday celebrations. The readings for Ash Wednesday are: Joel 2: 1-2, 12-17; Psalm 51: 1-18; Matthew 6: 1-6, 16-21. It is five years since I started searching for Private Daniel Commerford of Dundela Parish in Belfast. On 28 January 2012, I wrote that my friend and colleague, Dr Susan Hood of the Representative Church Body Library in Dublin, is trying to find any descendants of Oxford-born Daniel Commerford who was a parishioner of Saint Mark’s, Dundela, in east Belfast during World War I, and who served on the Western Front. She had recently unearthed a letter from Daniel Commerford from the Western Front to his rector in East Belfast. And the search for Daniel Commerford proved to be tantalising for anyone interested in Church history, military history, family history and the history of English literature. In 1918, this Daniel Commerford wrote from the Western Front to the Rector of Dundela, the Revd Arthur Barton, thanking him and the parish for a Christmas parcel they had sent to him in France. Daniel Commerford’s letter is one among a collection of letters sent by ten soldiers who were parishioners in Dundela that came to light and has been catalogued in the RCB Library. ‘While other letters that were written from the Front are found in other repositories and in private custody, the survival of a collection in a parish context is rare,’ Dr Hood said at the time. The parish of Dundela was formed in 1876, the first ‘modern’ parish to be created in the growing suburbs of rapidly expanding east Belfast in the second half of the 19th century. The church was designed by the English Tractarian architect, William Butterfield, and was consecrated on 22 August 1878. The church’s distinctive sandstone bell-tower could once be seen all over Belfast and whilst continues to be a conspicuous landmark. In the early 20th century, the social diversity of Dundela was enriched by numerous working class families linked with Belfast’s factories, mills and shipyards, and many of them lived in the village of Strandtown, nearer to Knockbreda parish from which the parish of Dundela had been carved. By 1914, on the eve of the World War I, Dundela parish about 450 families, many of them living in Strandtown. The Revd Arthur Barton was appointed to Dundela just four months before the outbreak of World War I. During the war, he cut a dashing figure In Dundela as he cycled around the parish, visiting and supporting families missing their loved ones and trying to encourage a wider spirit of community among those left behind. The letters provide poignant descriptions of the realities of World War I and its impact on the lives of families in one Belfast parish. All ten letters were written between the end of January and late February 1918, and probably relate to parcels sent before Christmas. 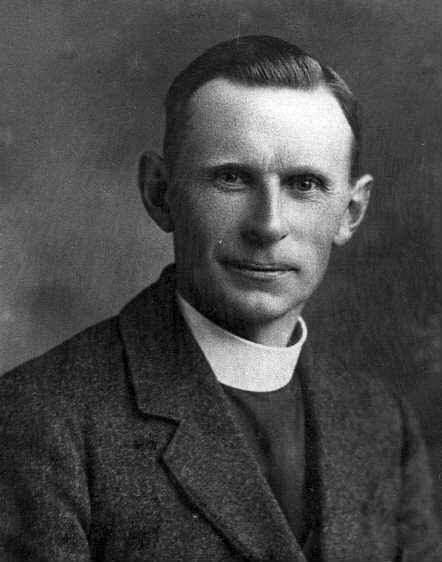 The Rector of Dundela, the Revd Arthur Barton (1881-1962) had been a curate in Saint George’s, Hardwick Place, and Howth, Co Dublin, before moving to Belfast in 1912 as head of the TCD Mission (1912-1914), working in the working class areas of Crumlin and the Shankill. He was Rector of Dundela from 1914 to 1925, and later served as Rector of Bangor (1925-1930), when he was also Archdeacon of Down, and then became Bishop of Kilmore (1930-1939) and Archbishop of Dublin (1939-1956). Daniel Commerford was older than the other nine letter writers. Taken together, the letters provide poignant descriptions of the realities of World War I and its impact on the lives of families in one Belfast parish. All ten letters were written between the end of January and late February 1918, and probably relate to parcels sent before Christmas. Dundela is also of interest as the home parish of CS Lewis (1898-1963), best remembered today for the Screwtape Letters. 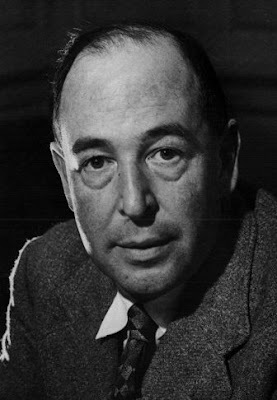 CS Lewis had been baptised in Saint Mark’s in 1899 by his maternal grandfather, the Revd Thomas Hamilton, then rector of the parish; his father, Albert Lewis, a solicitor, was originally from Cork. By 1911, when Daniel Commerford was living in Dundela, Lewis had been sent to school in England, and was a pupil at Barton’s old school in Watford, Wynyard School, from 1908. He returned to Dundela after Barton became Rector of Saint Mark’s in 1914, and refers affectionately to Barton in his autobiography. In 1917, Lewis left University College Oxford to volunteer in the British army and was commissioned in the Somerset Light Infantry. He arrived at the front line in the Somme Valley in France on his 19th birthday, and experienced trench warfare. On 15 April 1918, two months after Daniel Commerford wrote to Barton, Lewis was wounded and two of his colleagues were killed by a British shell falling short of its target. On his recovery in October, he was sent to Andover. He was discharged in December 1918, and soon returned to Oxford, receiving a first in Greats in 1922 and a first in English in 1923. I wondered, when I was writing five years ago, whether Did Daniel Commerford and CS Lewis had ever known one another? Did they ever share their reminiscences of Arthur Barton? Daniel was born in Oxford, so I wondered whether they had ever talked about their very divergent experiences of Oxford? Did they ever meet in France? Did Daniel Commerford’s children have any living descendants? The names of 31 men from the parish who died during World War I are recorded on the 1914-1918 memorial in Saint Mark’s, but none of the letter writers is among them. Further research by Dr Hood at the Somme Heritage Centre in Newtownards, Co Down, shows that none of the ten Dundela soldiers was killed in the war. My blog posting was soon published as a four-page feature in the March 2012 edition of The Lion, the parish magazine of Saint Mark’s Church, Dundela. There had been speculation that Daniel Commerford, like other parishioners in Dundela, had survived World War I and had returned to live in Belfast. But I failed to find him in Dundela. There were no responses to my blog posting or the parish magazine feature, and my search seemed to draw no further information. For the past five years, all the questions I posed had remained unanswered. Then recently, while I was researching other stained-glass windows, I came across a photograph on Facebook and another from the Representative Church Body of a window in Saint Polycarp’s Church, Finaghy, on the Upper Lisburn Road in Belfast, erected by the parishioners in 1949 in memory of Daniel Commerford. 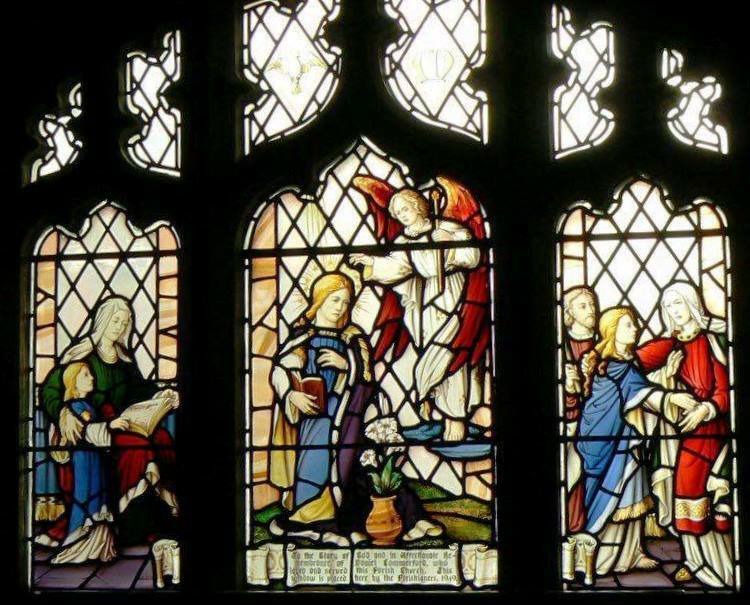 The window in Saint Polycarp’s now provided clues that allowed me to trace Daniel’s post-war life, and to find his descendants in Belfast, England and Canada. Saint Polycarp’s Church was consecrated 85 years ago in 1932, and this window was part of the whole iconographic scheme proposed that year by the Shrigley & Hunt studio in Lancaster. 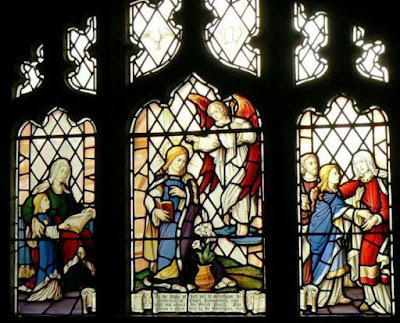 However, the Commerford window was not put in place in the south aisle nave of Saint Polycarp’s Church until 1949, when it was erected by the parishioners in memory of Daniel Commerford, who had died two years earlier on 27 October 1947, almost 70 years ago, at the age of 68. 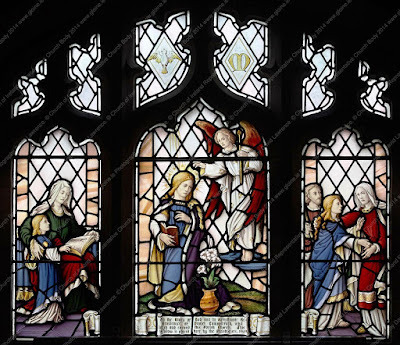 In all, the Commerford window is made up of three lancet windows, measuring 820 mm x 340 mm, 920 mm x 510 mm, and 820 mm x 240 mm, and six tracery-lights. To the glory of God and in affectionate remembrance of Daniel Commerford who loved and served this parish church. This window is placed here by the parishioners, 1949. 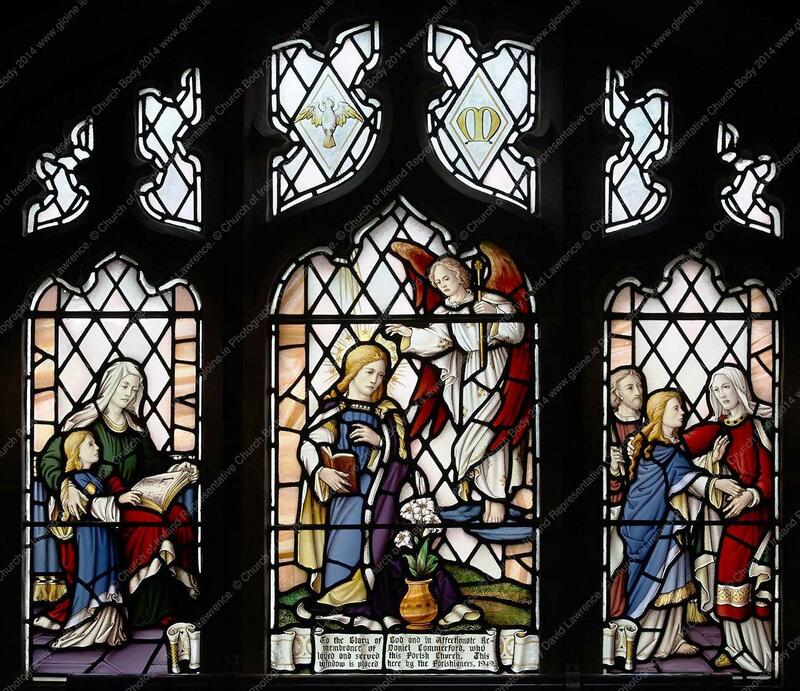 The window in Saint Polycarp’s that Daniel Commerford led me to some other sources, and confirmed indeed that Daniel Commerford had survived World War I and had returned to live in Belfast. The parish registers in Dundela record that before World War I, Daniel Commerford was living in New Street and a coachman, while a search of the 1911 Census online found only one possible D. Commerford living in Belfast. That Daniel Commerford was living in House No 37, Ballymacanallen (Tullylish), Co Down. The census returns show Daniel Commerford was a coachman. He was born in Oxford and was aged 31 years in 1911, making him 38 by 1918. He was married to Edith (then aged 29, and born in Co Down), and in 1911 they had three children, from the ages of six down to one: Arthur (6), Hubert (4), and Margaret (1), all members of the Church of Ireland. Now, a number of sources and some recent searches, have shown that when Daniel returned to Belfast he moved to Finaghy, and he and Edith had more children. Indeed, his last surviving child, Evelyn Mary Commerford (1921-2016), was still living when I set out on this search, and died in Belfast within the past year, on 14 April 2016. Her funeral service was held in Saint Hilda’s Church of Ireland parish church in Dunmurry. Daniel J Commerford (1879-1947), was born in Oxford 2 June 1879. A coachman, he was living at 47 South Richmond Street, Dublin, in 1903, at Thornhill, Shankill, Bray, in 1904, at Ballymacanallen, Tullylish, Down, aged 31 in 1911, and at Bannvale, Gilford, Co Down, when he signed the Ulster Covenant at West Gilford Orange Hall in 1912, and in 1913. On 19 September 1903, he married Edith Violet Laverty (1881-1964), a daughter of William Laverty (1857-1934) of Banbridge, and his wife Sarah (née Rankin) Laverty (ca 1848-1940). At the time of her wedding, Edith was living at Straffan House, Co Kildare, then the home of the Barton family. The wedding was solemnised in the Registrar’s Office in Dublin (witnesses: Matthew Hamilton, Mary Anne O’Brien). Daniel J Commerford last lived at 3 Lille Park, Finaghy, and died at the age of 68 on 27 October 1947. He was buried two days later in Belfast City Cemetery. Edith, who was born 11 October 1881, died 7 June 1964, in Finaghy, Co Antrim, and she is buried in Belfast city cemetery. ●1a, June Commerford, died in Belfast 1 January 1937. ●1a, Lucinda Evelyn (Lynn) Commerford (ca 1941-1950), born in Bromsgrove, Worcestershire, ca 1941, and died in Birmingham in 1950. ●2a, …, a daughter who married … Wood. Hubert Commerford married (2) Martha … (1907-1993), born 1 February 1907, died June 1993, King’s Lynn, Norfolk, and buried in King’s Lynn. 3, Margaretta (1909-1970); born 19 April 1909, died 19 July 1970. She married William Ferguson (1909-1988), of Hillhall, Lisburn, and they were the parents of one son and three daughters, James (Jim) Ferguson, Valerie Scott, Margaret Ferguson and Maureen Ferguson. 4, Frances Sarah, born 14 August 1911, in Gilford, Co Down. She married Walter Wright (1921-2003). He was born in Liverpool on 18 February 1921, and died in Belfast on 28 November 2003. They were the parents of Pauline Patricia Wright (1942-1967), who was born 26 September 1942, and died in a car crash in Donegal on 26 March 1967. After the death of Frances Sarah (Commerford) Wright, Walter Wright remarried. 5, Violet Edith (1913-1992). She was born on 29 July 1913, in Gilford, Co Down. She married Hugh Twyford (1912-2003), an electrical engineer. She died on 27 March 1992 in Newtownabbey, Co Antrim. Hugh Twyford was born on 16 November 1912 in Cuper Street, Belfast, and died on 5 November 2003 in Glengormley, Co Antrim. They were the parents of two children, including a daughter: Edith, who married (1) Eamon Patrick Stewart, and (2) Robert Rana Partap Raj (Kukar) (1928-2013); he was born in Kahrorpuka, India, now Multan, Pakistan, on 11 December 1928 and died in Belfast on 22 January 2013. 6, Daniel John (Jack) Commerford (1916-1918), born 9 November 1916 and died on 29 April 1918 in Strandtown, Belfast. 7, Evelyn Mary Commerford (1921-2016), born 26 July 1921 in Belfast, and died on 14 April 2016 in Belfast. Her funeral Service was held on 19 April 2016 in Saint Hilda’s Church of Ireland church, Dunmurry, and afterwards at Roselawn Crematorium. 8, An unnamed stillborn daughter, born 11 February 1923. The search for Daniel Commerford’s descendants continues. But now the search may also begin for his ancestors, and the search for how they got to Oxford from Ireland. REFLECTIONS FROM THE REFUGEE CAMPS IN GREECE from USPG on Vimeo. Today is Ash Wednesday, and the season of Lent begins this morning (1 March 2017). Later this evening, at 8 p.m., I am presiding at the Eucharist, marking the beginning of our pilgrimage through Lent to Easter, in Saint Mary’s Church, Askeaton, Co Limerick. The Readings are: Joel 2: 1-2, 12-17; Psalm 51: 1-18; II Corinthians 5: 20b to 6: 10; Matthew 6: 1-6, 16-21. Give thanks that God can empower and equip all people to be disciples and use our gifts and talents to build a kingdom of justice, peace and joy through the power of the Holy Spirit.